Thanks to Tralee Outlook for the recent coverage highlighting the importance of artificial grass pitches, especially at this time of the year. As we head into the winter months it gets harder to arrange training and practice matches on pitches due to the weather. Artificial grass pitches around the country become the go-to choice for clubs and schools to ensure that team development can continue even as the longer nights draw in. 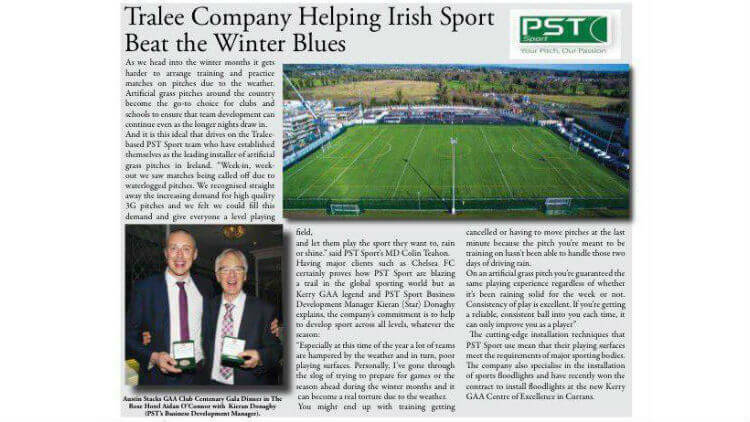 And it is this ideal that drives on the Tralee-based PST Sport team who have established themselves as the leading installer of artificial grass pitches in Ireland. said PST Sport’s MD Colin Teahon. “Especially at this time of the year alot of teams are hampered by the weather and in turn, poor playing surfaces. Personally, I’ve gone through the slog of trying to prepare for games or the season ahead during the winter months and it can become a real torture due to the weather. You might end up with training getting cancelled or having to move pitches at the last minute because the pitch you’re meant to be training on hasn’t been able to handle those two days of driving rain. The cutting-edge installation techniques that PST Sport use mean that their playing surfaces meet the requirements of major sporting bodies. The company also specialise in the installation of sports floodlights and have recently won the contract to install floodlights at the new Kerry GAA Centre of Excellence in Currans.